This is an engraved cricket medal, 50mm diameter, showing a cricket bat, cricket ball and stumps. All prices for cricket medals include up to 50 characters engraved free, with additional letters charged at 15p a letter. The cricket medal is engraved in a standard block font, on the back of the medal. Choose a gold or silver effect cricket medal when ordering. The order process also gives options and additional prices for a medal pouch, medal ribbon or medal box when ordering. 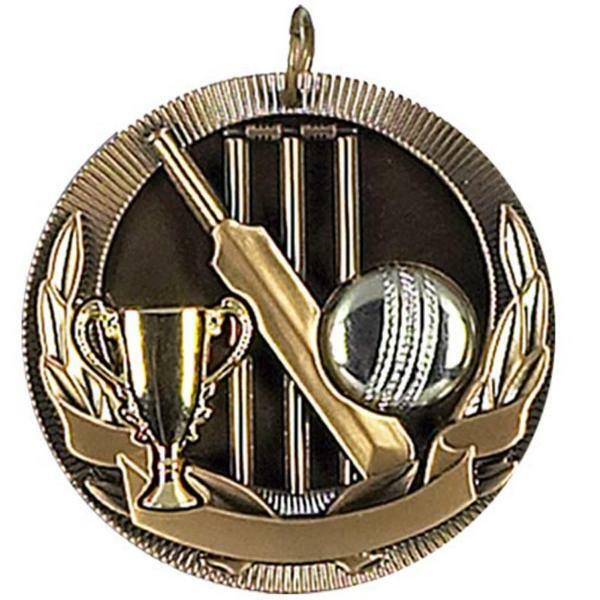 The cricket medal makes a perfect momento of the season for your cricket team. The postage rate for the engraved cricket medal is band A. This cricket medal has been discontinued by our suppliers although we do have a small number in stock. Contact us for details or an alternative cricket medal.